A primary doctor or a specialist, usually a rheumatologist, can make a diagnosis of fibromyalgia from your symptoms and physical examination and after tests for similar conditions. The old 1990 diagnostic criteria for fibromyalgia required the presence of at least 11 out of 18 possible tender points located on both sides of the body and above and below the waist (Picture 1). Body pain in at least 4 of 5 body regions is present. Pain and other symptoms, such as fatigue and mood changes, have been present at a similar level for at least 3 months. Symptoms are of a certain severity (explained in detail here). A diagnosis of fibromyalgia does not exclude the possibility of other health conditions. 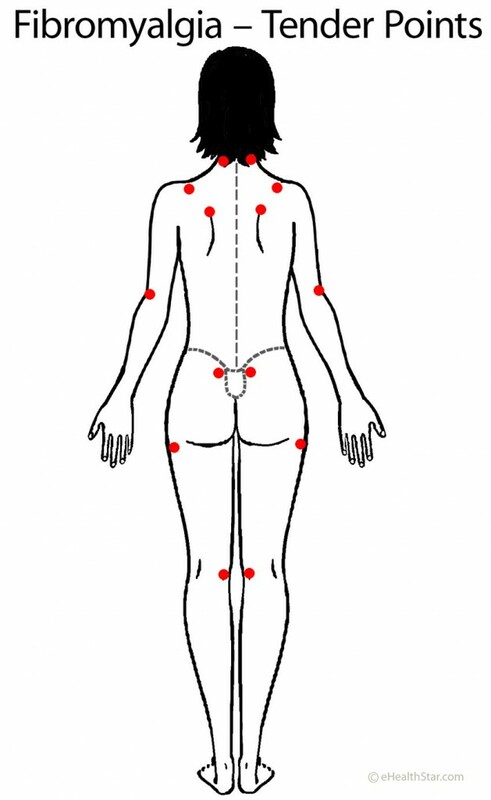 If you have fibromyalgia, you can have tender points but also trigger points . Trigger points, which are typically associated with muscle knots, are not a sign of fibromyalgia but a co-existing myofascial pain syndrome (Chart 1) . Fibromyalgia currently cannot be detected by any known test [7,8]. According to the U.S. Food and Drug Administration (FDA), the FM/a test based on the cytokine levels in the blood is not reliable. Before making a diagnosis of fibromyalgia, a doctor will likely suggest some blood tests (red and white blood cell count, sedimentation rate, mineral, vitamin and glucose levels, rheumatoid factor, antinuclear antibodies) or imaging investigations (X-ray, CT, MRI) to check for similar conditions (Chart 2). You may want to insist in finding the exact diagnosis of the unknown pituitary mass.